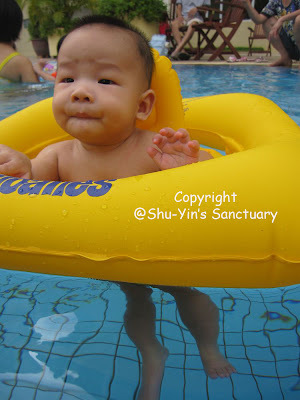 It was Shern's first swim - his first time going down our apartment's swimming pool. 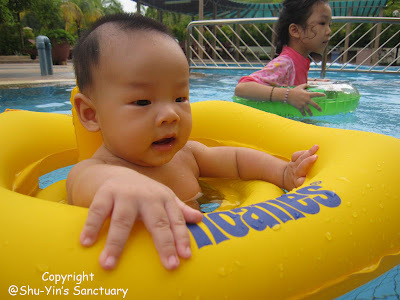 Before we brought him down, I googled about bringing 5-months old to swim in chlorinated water - it seems like it is OK as long as it is not for too long and make sure we bathe him after that. Well, Shern was so excited when he saw the other kids there playing around. He did not even bother to look at Min & I when when wanted to capture him on camera. His eyes were darting here and there and he kicked his legs excitedly. 15 mins later, we pulled him out from the pool and wrapped him up in his towel. Up to our apartment for a warm bath. I would say that Shern's first swim was a success - he had a blast of a time! bee...he sure having loads of fun! so cute and BRAVE! my Jaden is scared of swimming in the pool.. sigh.. got to throw him in more to let him get used to it when I get the opportunity next time.